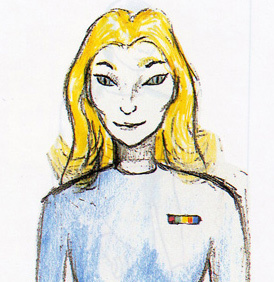 Tall blond humanoid with “cat eyes” that had light blue irises surrounding dark, vertical pupils. 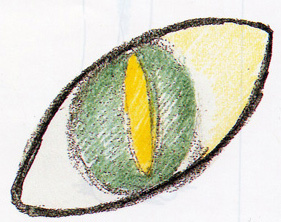 Some blond entities had green irises surrounding yellow, vertical pupils. Other beings had yellow-gold irises surrounding dark, vertical pupils defined by thin orange line around cat-eye pupil. Illustrations by New Jersey adult female “Wanna Lawson,” who was abducted along with her family from the Pennsylvania Turnpike on November 27, 1983. Source: Glimpses of Other Realities, Volumes I and II, © 1993 and © 1998 by Linda Moulton Howe. See: Earthfiles Shop. September 5, 2013 Albuquerque, New Mexico - After producing the previous Parts 1 - 3 Earthfiles with Tyler Jones and Wanna Lawson, I have received viewer questions about the roles of Christ, Krishna, Buddha and other Earth avatars in the alleged Tall E. T. conflict. So I am reprinting here as a Real X-File another sensitive part of Wanna Lawson's experience that was not included in Part 3, followed by the extraordinary case of Ken Rose. Previous PostPrevious Update September 4, 2013: Japanese Government Will Spend $470 Million On Underground Ice Wall by March 2015, to Stop Radioactive Leaks. TEPCO’s Leaking Storage Tanks Still Out of Control.